Parents are the primary educators of their children. At St. John's, our hope is to develop strong Catholic families in which children learn the joys of following Jesus Christ and the truths of our Faith through the witness of Christian life given by their parents. A Family of Faith was developed by The Sophia Institute and it is the family faith formation program in use at our parish. 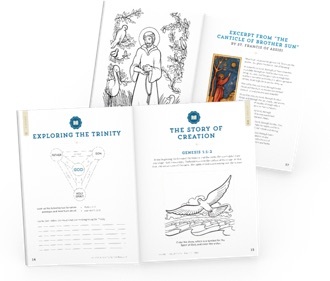 A Family of Faith is designed to take families through the entire Catechism of the Catholic Church over the span of 4 years. Each month will cover a different topic. Parents will have a meeting on the first Wednesday of the month from 6:30-7:45pm where they will learn the two lessons for the month and be empowered with the tools to teach the lessons to their children at home. Activity books for kids and Parent Guidebooks will be provided to make the lessons more interesting for children and easier for parents. Each lesson at home should take no longer than 30-45 minutes to complete. It is a great way for parents to bond with children teaching them the importance of faith in family life. Adult Meetings for parents and guardians meet the first Wednesday of the month from 6:30-7:45pm. Community Meetings for both parents and students will meet the last Sunday of each month at 3pm. A Family of Faith is not designed for Sacramental preparation. For children who will be receiving a Sacrament (2nd Grade - Sacrament of Reconciliation, 3rd Grade - Sacraments of Confirmation and First Communion) additional materials and instruction will be required. Some images and text on this page provided by The Sophia Institute.